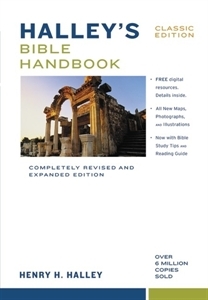 Halley’s Bible Handbook is a must for anyone who is serious about studying God’s word. It is an excellent book for those who are just beginning their walk with the Lord, as well as a great study help for those who have been digging into the scriptures for years. In its description on the back cover you read, “From the first edition, a small give-away booklet of 16 pages, it has grown into an 864-page almanac of biblical information”. You will find yourself referring to its pages again and again as you study the Word. Halley's Bible Handbook was born out of the conviction of Henry H. Halley that everyone ought to read the Bible daily. From its first edition, a small give-away booklet of 16 pages, it has grown into an 864-page almanac of biblical information, used regularly by hundreds of thousands of laymen, teachers, and ministers. Halley's Bible Handbook contains more biblical information than any other book of its size. It has been a continuous best-seller through the years and has sold more than five million copies in many languages.